Hi! First post. 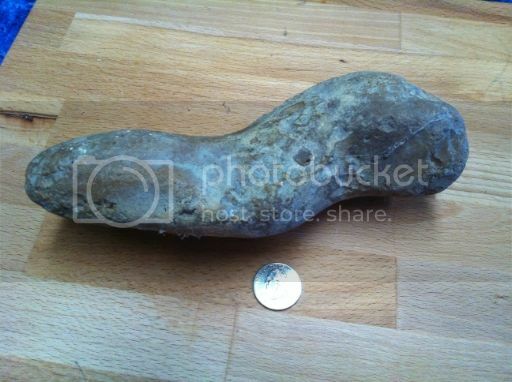 I found this site over the weekend when I found another hammer stone...at least I think that is what it is. 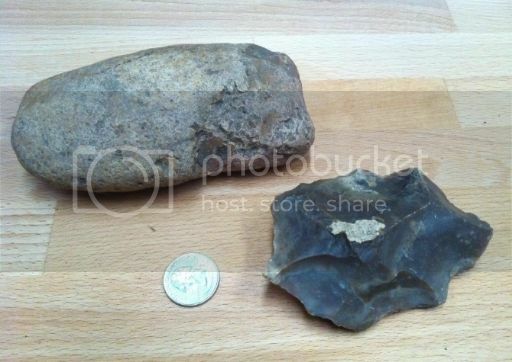 I'm one of -those- people who know nothing about the rocks they find, but I'd like to know something about these items. We have lived in western Bastrop County for over 30 years on the same few acres. 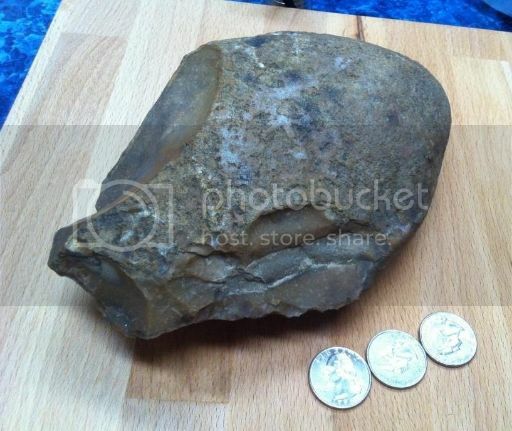 Over that time I have found a spear point, a game ball, a bunch of hammer stones and what looks like half a bowl hollowed out of a piece of flint and a couple of smooth stones that look like worry stones. Our property is full of flint an rose quartz. Like I said above, I know nothing of the age or importance or value of these items. If I post photos (not sure how) can someone here give me an idea of what time frame they came from and what peoples may have left them? ….or even if they are just junk? After I made the first post I walked around the back of our property by a dry creek bed and found this, laying on the bank. Is it anything?? It looks like it could be. Hope my photo link thingy works. 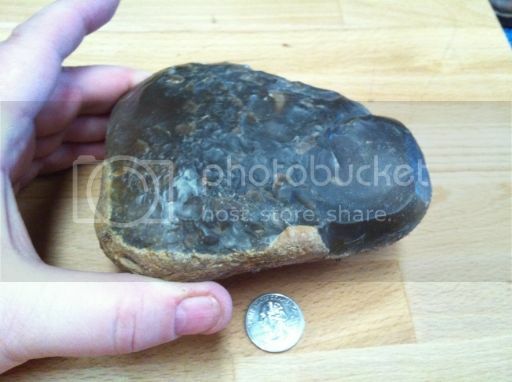 It could be some sort of crude chopper or simply a chunk of naturally broken flint. 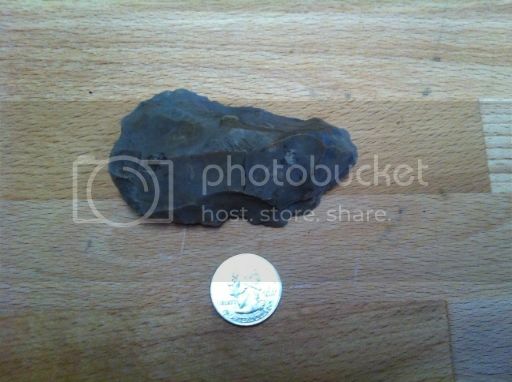 Post a pic of the spear point and perhaps it will provide a clue to the people that made it. Cheers. That large piece I just found weighs over 4 pounds. Here is the game ball that I found and two smaller balls that I can't tell if they are old marbles or game balls. I found all three about the same time and within about 75 feet of each other. The white ball looks like a rock, it is a little shiny but it has some pitted areas. The red ball looks like a marble because it's so shiny but it is not perfectly round like I would think a marble is supposed to be...AND I think it's odd that both small rocks are the same size. I'm still looking for my "box of indian rocks"...my husband doesn't think as highly of my rocks as I do and he can't remember where he put them. 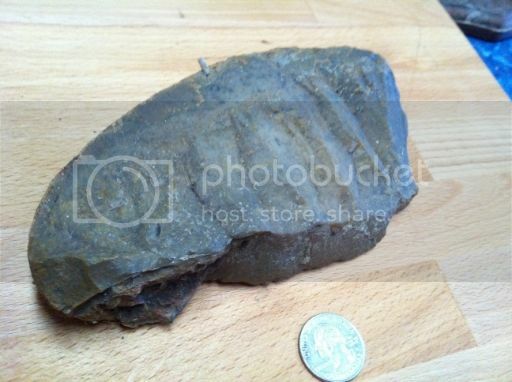 I also found a stone axe head about 35 years ago in Manchaca when my dad lived near Bear Creek. My dad had it mounted on wood, but I haven't been able to find it lately...it was white and about the size of my palm. I found these today too. They maybe look like they have been worked?? Good picture show Tam, It seems almost sure that native Americans at least walked on every square foot of Texas no matter how good or bad the local conditions may have been..almost every find that is not natural may have been modified by early humans.so my thoughts on your finds. 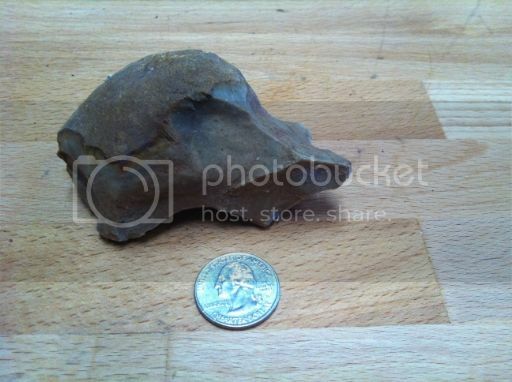 Top pic, flint nodule, probably chipped to see if it was a worthwhile piece...when it flaked off the largest hollow section the guy threw it away as not for him....Flint cannot be deliberatly knapped into a hollow so it's not an attempt at a paint bowl. All 3 "game balls", are too perfect for the ancients...if that red one is not perfectly spherical, the best it could be is colonial..
bottom pic; top one, a very nice sized flint nodule man chipped to make a classic hand ax or bone crusher. Last looks very much like a flint "CORE"...thats what has been left after all the flakes of interest have been removed. Bastrop county was a good locality for the ancients...Keep looking down ! I'll have to post more photos when I find the box of rocks...and I need to figure out how to make the photos smaller since "resizing" on photobucket didn't seem to work. The smaller balls have always been questionable to me. 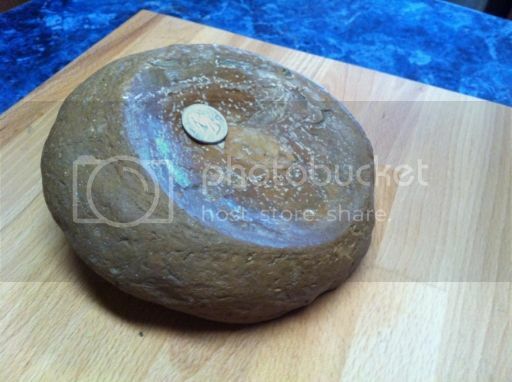 The larger ball does seem to be made out of rock and it's not shiny but it is very smooth. It is heavy for it's size and weighs 34 grams. Smaller balls are much more difficult to identify. Tom. You have lost your marbles. ...whew...I thought it was just MY mind. Tammy, you weren't alone. Via seperate media, he has taken displeasure with my post and therefore will be refered to as "small potatoes" in honor of his home state. Guys Idaho is good people I certainly doubt he was being militant. He's a character as seem by the sarcasm in a good deal of pot. If you have met you you'd understand he an Hal are two hams in a hole. Thanks for the kind words Snoop. Tom must have consumed way too much Geritol. Of course my comment was innocuous and well intended. Tom has been remanded as my number # 2 , and shall remain so until we again meet on the screening tables. Pray for his speedy recovery. Please disregard his tater tot comments. I will speak with him on alternate media. For my part, it was all in good fun. I've worked in a male dominated field for over 22 years and my sense of humor has become more guy-like as well. I've dug with both Tom and Idaho, enjoyed both their company every time. Dug with Hal more then once. Gotta watch him though, he does play tricks. Hope to be down there in May to sling some dirt with them. Well said Tammy! Its all good fun. My friend Tom is an artifact and sometimes strays from my well intentioned comments. I will speak with him. Where is the pic of that spear point? Surprisingly, we don't get that much snow. The wind takes it all south and east of here. This weekend we're getting 40 -50 mph winds, the passes over the Rockies, gust to 90 to 100 miles an hour. Figure to give you a holler before we head down there. Might even scrounge up Tom and possibly Hal if he's on good behavior. Ken. The proability of Hal being on good behavior is zilch. Tom will likely be stuffed in a museum somewhere. We needing a good screen somewhere but where is the question. Will keep you posted. Enjoy the winter. 70 today. Summer coming. ...still looking for my box. Tonight my husband said it may be out with the riding mower, but I'll have to look this weekend during daylight...too many rattlesnake possibilities with the warm up, especially since that is where we keep the horse and chicken feed. Tammy, I think I would google and check "antiques marbles" and then go from there. 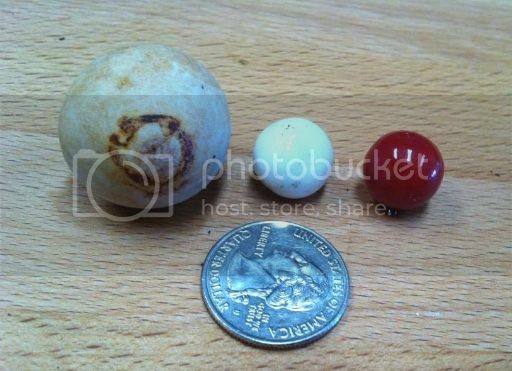 I tried it and believe you can get some meaningful information as to the vintage of the marbles excluding "size". For those of you that don't know "tater" and I, we met in the aftermath of Hurricane Ike (a great story onto it's own and one I'm afraid I will get killed over if I share). We started hunting together and it turned into competition from the start. JT and Janie, Ken and Betty and Chris and his wife were there for the "Battle of Barksdale" where I defeated the evil empire with a LaJita drill. Tater must have had a premonition as he could not attend the finding of the Barksdale Bell. I was soundly defeated at Pipe Creek as Snoop can attest but rallied at the first Vanderpool showdown and lost the 2nd to his "stacky" Montell as Jason Garrett and Cyrus will attest. Over the years, it has been fun and will continue to be as we prepare to square off in the 2014 season. I would like to see all the contributors to this string attend as if nothing else, we have alot of fun at each others expense. Tater can have only one excuse this year (hint hint). Tater is fully prepared to answer your challenge. Will you be screening from the chair this year? Now all we need is a screen dig location. Rest up Mr. C and dont forget the Geritol. Okay, still have not found the points BUT I did find a box of rocks that I forgot I had and I think y'all might like it!! This was the piece I found when my father lived off of Burson Drive in the Bear Creek subdivision in Manchaca...I found it in a little patch of woods next to the house, just laying there in 1979. True "ghost" story, about that same time I was in those woods sneaking a cigarette (yes, I thought I was a cool teenager), and I felt a strong shove to my left shoulder...I thought I was caught! I turned around and no one was there...! 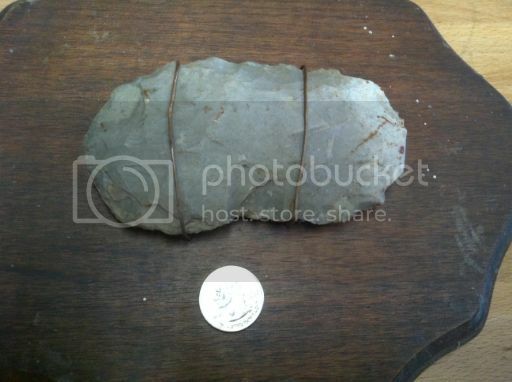 The piece below is the first piece I found on this property in Bastrop County about 1984. I had no idea what it was, only that it helped me cut the string in my garden and I popped it in my pocket. An old guy that worked at Travis State School with me at the time told me that the black marks were "pitch" used to secure the rock to a stick. This piece is cool. I don't know what it is only that it seems made to fit the hand and it looks like there is some pitting on the end. Why are some pieces worked like this one? Was this some type of "drill" ?? I have several more items if anyone is interested in seeing them, I'll post more photos. As I have said, I know very little on this subject, however, it seems like my rocks are more primitive than the finely worked pieces I've seen here.